Hurricane Harvey Donations - Real Estate by Brooke D.
So proud to be affiliated with a company who responds so quickly. 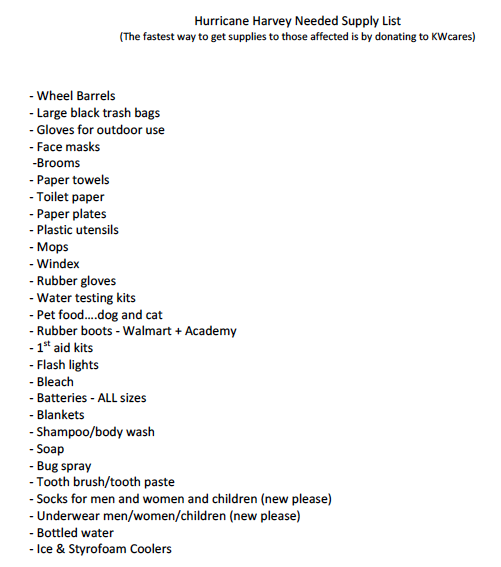 My KW office here in LA (El Segundo/Manhattan Beach) is putting together a donation drive to collect essentials that our Houston friends need. We will have a drop station at my office for those who want to donate. Clear your pantries – it’s time to help! 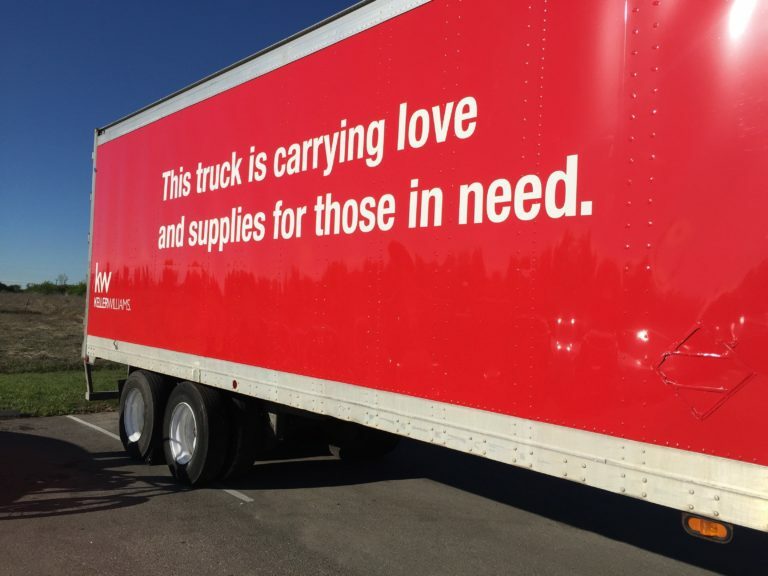 Keller Williams’ charity arm, KW Cares, has three bright-red 18-wheeler trucks parked at a depot outside Austin, Texas, ready to enter Houston. Packed with generators, nonperishable food, diapers, cleaning supplies, wheelbarrows, flashlights and more, the trucks have been prepared to roll out since Monday, when Hurricane Harvey continued to make its ugly way through the region and wreak havoc. But no matter how ready the trucks are, KW Cares can’t budge because it’s not safe to travel the flooded roadways. With 16 market centers and 4,400 associates in Harvey’s footprint, Keller Williams has also lined up three warehouses to help with the aftermath — one in San Antonio, one in Corpus Christi and one in the dryer part of Houston. But because of the way the storm has developed, Houston will be the command center. By Friday, the warehouse will be fully staffed. Other large real estate brokerages gave their responses this week to the disaster. Realogy has pledged to match up to $50,000 for Red Cross Hurricane Harvey relief for funds raised via the Realogy Charitable Foundation. “Our thoughts continue to be with everyone who is being impacted by Hurricane Harvey,” said a spokesperson from Coldwell Banker, a Realogy franchise brand. On the local level, Coldwell Banker’s D’Ann Harper in Texas has launched a fundraiser in concert with the American Red Cross to help families by raising funds, volunteering and working with local shelters. Re/Max, which had more than 2,600 Re/Max associates in over 110 offices in the Texas Gulf Coast directly impacted by the storm, was working so ensure its agents and their families’ needs were met swiftly, it said Tuesday. “We’re creating an online hub with information and resources for anyone affected including help and support from surrounding Re/Max offices. We are one community of Realtors supporting each other. In addition, Re/Max, LLC is donating $50,000 to the American Red Cross to aid relief efforts in the days, weeks and months to come and we’ll continue to look for ways to support those in need,” said Adam Contos, Co-CEO at Re/Max. The National Association of Realtors is working directly with the Texas Association of Realtors to determine how best to support their needs with grant funds from the Realtor Relief Foundation, with 100 percent of donated funds made available to members and consumers to assist with housing-related needs. “The immediate focus of the National Association of Realtors and its 1.2 million Realtor members is to support those affected by this tragic natural disaster,” said NAR president Bill Brown. The Realtor Relief Foundation, dedicated to providing housing-related assistance to victims of disasters, is collecting donations. In a post, HAR advised its Realtors and members to “please like and share” the page. “Your HAR leadership is trying to coordinate efforts such as drop off points for incoming items from amazing REALTOR associations across the country as well as coordinating local efforts once the storm waters recede. As of Tuesday morning, Keller Williams has confirmed 312 KW agents whose houses have been damaged by the hurricane to some degree, said spokesperson Darryl Frost, who expects this to rise. Leadership had made sure to touch based with each of the affected 4,400 associates this week, he added. On Monday afternoon, Keller Williams sent an email out to all staff to outline what steps it was taking to help its agents in the affected communities. Many around the country have asked what they can do to help. Neu was heartened by stories of KW agents going beyond the call of duty in flood-stricken Houston. Once further damage has been assessed, KW Cares will implement the “Heart to Heart” program, in which a market center can elect to “adopt” a family and provide for their needs over the coming weeks.